The University of Winnipeg Board of Regents approved redevelopment of 460 Portage Avenue and 491 Portage Avenue in the 2009-2010 Capital Budget at their June 23, 2009 meeting. An historic $4 million dollar gift from Winnipeg business icons and philanthropists John and Bonnie Buhler to The University of Winnipeg announced Friday, January 22, 2010 supported construction of one of downtown's signature buildings at 460 Portage Avenue, the Buhler Centre, and provided financial support to business students with special scholarships. $3 million of the donation allowed UWinnipeg to consolidate its entire Faculty of Business and Economics inside the Buhler Centre at the corner of Portage Avenue and Colony Street, and includes state-of-the-art classrooms, computer labs and meeting spaces. The additional $1 million created the Buhler Knowledge Access Fund to provide ongoing business scholarships within the Faculty of Business and Economics to outstanding students and those in need, including single parents and those with lower incomes. In addition to the Faculty of Business and Economics, the eco-friendly Silver LEED Buhler Centre is home to UWinnipeg's Professional, Applied and Continuing Education (PACE) Division and Plug In Institute of Contemporary Art. 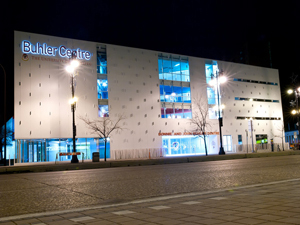 The Buhler Centre opened on time and on budget in September 2010. Stella's Cafe and Bakery opened at street-level for students and the general public in June 2011.